In industrial settings, it is common for a single centralized vacuum distribution header to supply several diverse processes, each with separate vacuum pressure requirements. For example, one piece of equipment may function best with 14 inHg vacuum, while another process requires 20 inHg vacuum. For this application, a vacuum regulating valve is needed on the processes requiring a lower vacuum pressure than the vacuum supply header. The vacuum regulator will control the pressure from the central vacuum distribution header to the vacuum pressure needed for the specific application. While vacuum breaking regulators are commonly used on vacuum pumps that supply a single pressure, these VBR’s are not suitable in this multiple-user vacuum distribution system because the VBR modifies the system vacuum for the entire header. In the schematic above, Process C requires a higher vacuum level than A or B. In order to use a shared vacuum supply pump, vacuum regulators would be needed in Process lines A and B to reduce the vacuum to the required level. Vacuum regulators work by restricting the flow from the pump to the process, and do not let air into the process. 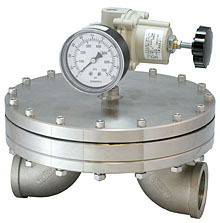 Equilibar vacuum regulators (EVRs) are built with the same technology as our patented back pressure regulators, delivering precise vacuum control over a wide range of vacuum flow rates. The EVR responds instantaneously to changes in setpoint and adjusts to changes in vacuum header flow to keep the process setpoint on track at all times. The EVR can be controlled manually or electronically for computer controlled processes. It is the perfect solution for centralized vacuum distribution systems. Equilibar EVR Valves comes in sizes 1.5″, 2″, 3″ and 4″ for industrial centralized vacuum applications. Available in Anodized Aluminum, SS316L and PVC.